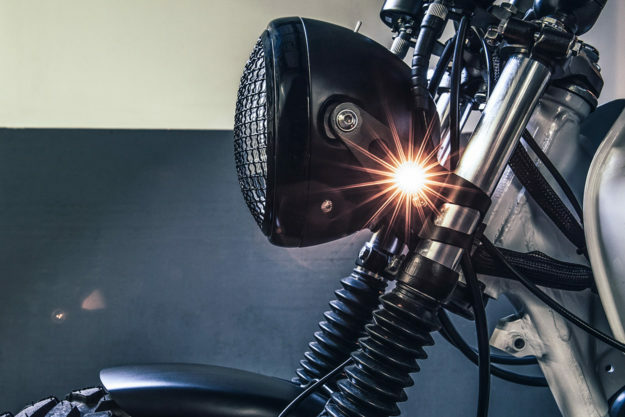 Ex-girlfriends have a habit of leaving things behind, but a motorcycle is rarely on the list. 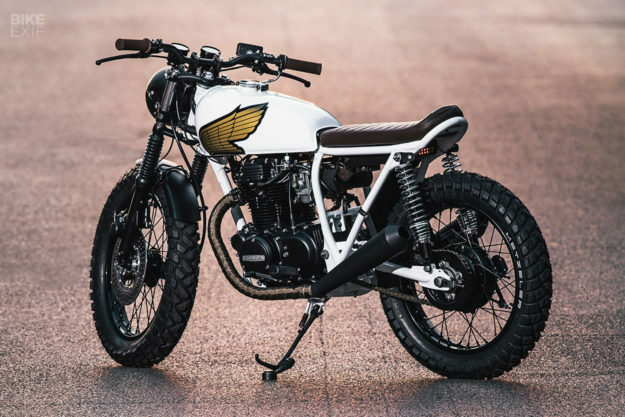 Yet that’s exactly how Federal Moto got their hands on this sweet little 1976 Honda CB360T. 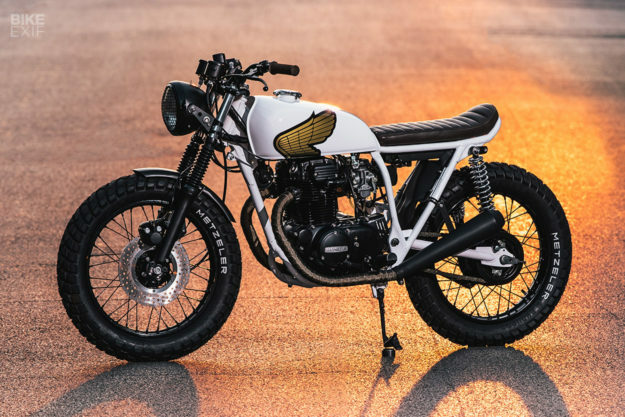 So what motivated Peter and his brother Mike to drag the CB360 back to life in their Chicago workshop? The perfect client, as it turns out. Around the time they were wrapping up their fifth build, a local professional in the financial industry approached them with a commission—something Peter and Mike tend to avoid. J Shia of Madhouse Motors in Boston found, cleaned, packed and shipped a complete cylinder head to the guys in less than a week. 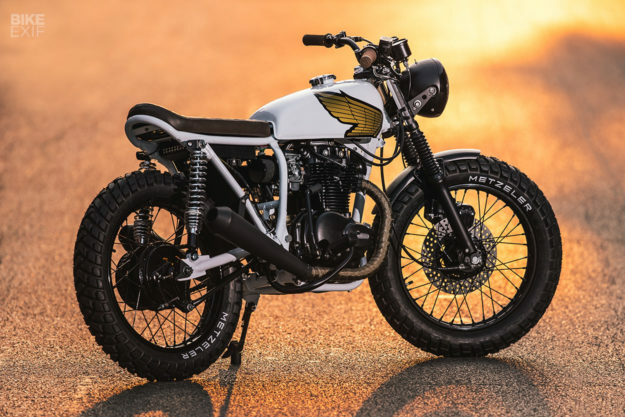 Brendan Macaluso of Common Motor Collective in Houston dug into his spare parts bins and had full engine, transmission, and carb rebuild kits—and some obscure tools the CB360 needed—ready to ship the same day. With everything they needed on their bench—and twelve rounds of design refinements behind them—Peter and Mike were ready to get cracking. They broke the CB’s engine and transmission down to the nuts and bolts, before painstakingly rebuilding everything. Every last part was inspected, recondition, honed, repaired or replaced. The carbs were rebuilt too, and the intake and exhaust manifolds were ported and polished. With the motor now sound, it was the frame’s turn to go under the knife. It was stripped and repaired when needed, before the subframe was cut-and-looped, and paired with a new matching seat pan. 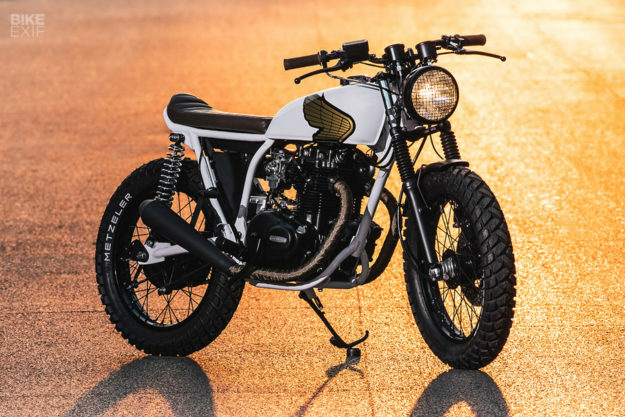 Federal rewired the Honda with a small Lithium-ion battery and electronic ignition, then tucked everything into a custom-made tray under the seat. 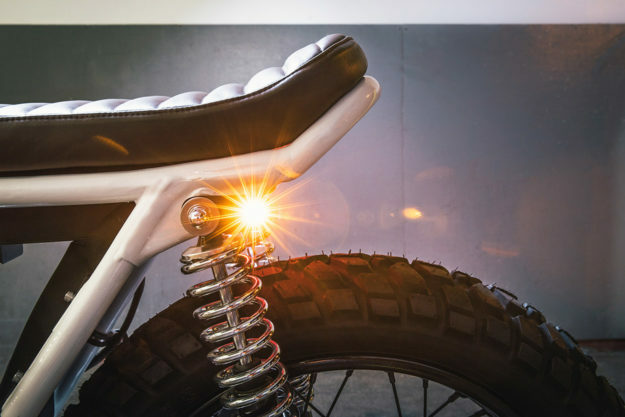 Just behind it is a discreet LED tail light, and a rear inner fender. The original exhaust headers were reconditioned, then cut and modded to take a pair of reverse-cone mufflers. 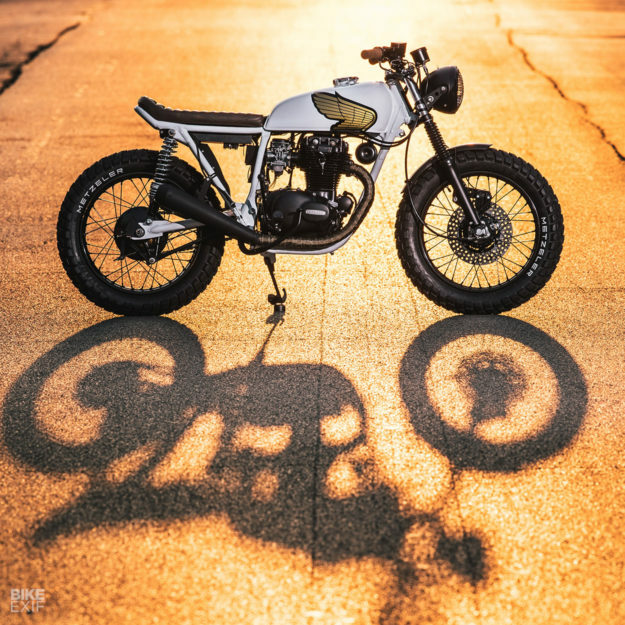 “It gave the CB360 a much deeper, throatier, and meaner bark than expected,” says Peter. Moving to the brakes, the guys rebuilt the front caliper and upgraded the system with Goodridge Sniper II lines, a modern master cylinder and a phenolic piston. Jeff Stephens at Goddffrey’s Garage then hooked the guys up with a drilled rotor. The tires are Metzeler Enduro 3 Saharas. 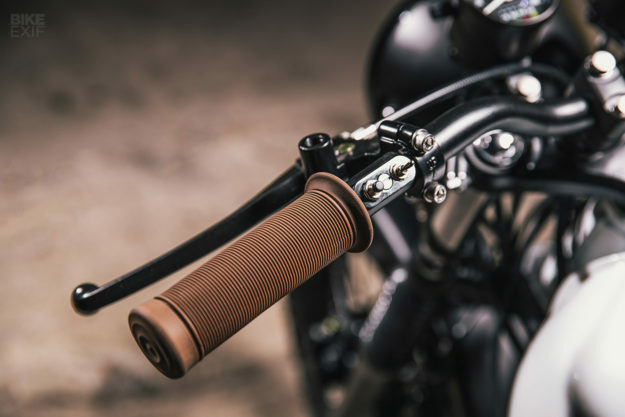 For the cockpit, Federal installed new handlebars with POSH mini switches and Biltwell Inc.’s popular Kung Fu grips. 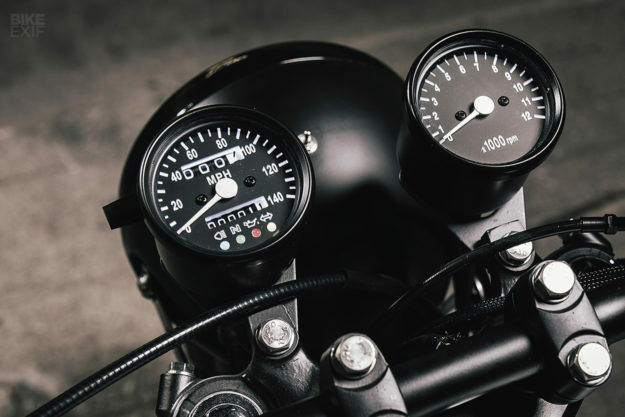 There’s a new headlight, speedo and tach up front too, and the bike’s sporting tiny high-output LED turn signals all round. Federal finished ‘The Backburner’ off with a new coat of black on the engine, stainless steel fasteners all round and a polar white finish on the frame and tank. 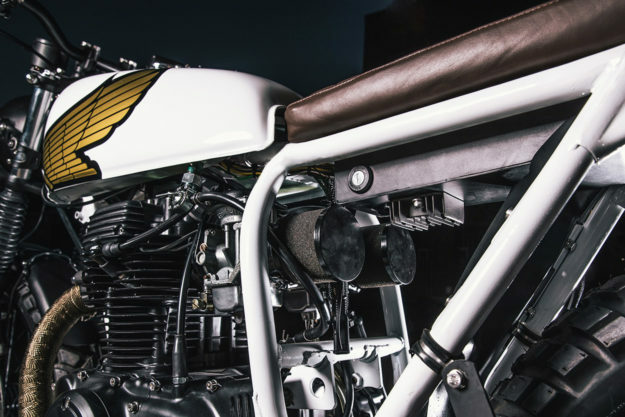 Gus Abarca of The Iron Stables handled the paint, adorning the tank with oversized gold Honda wings. As a final touch, the seat was treated to full grain brown leather upholstery. 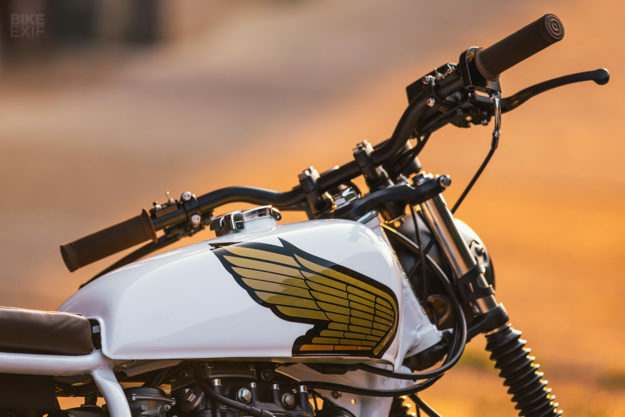 As we’ve come to expect from Federal Moto, this dusty box of bits is now a sharp, slick street tracker. We’d pick it as a daily runabout without hesitation, but it would have to be for solo missions. For some strange reason, Peter and Mike left the passenger pegs off.